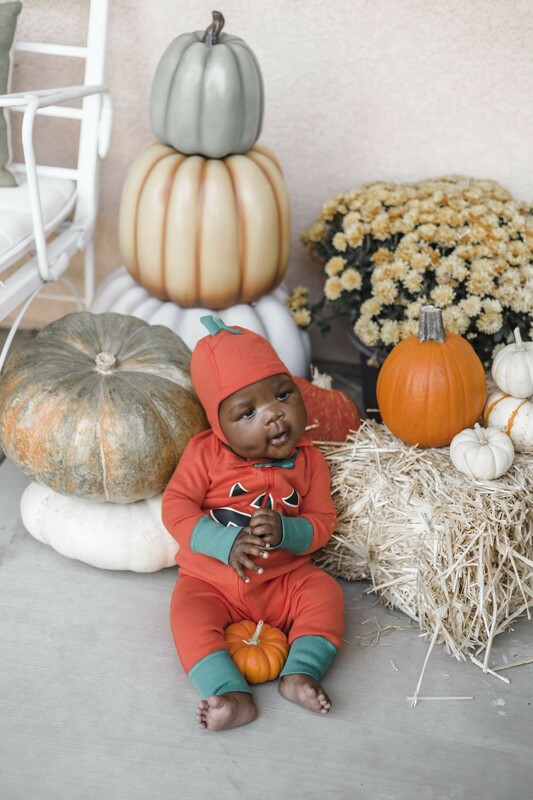 When you have a cute baby as squishy as Nina, you cannot simply dress her up in only one costume for Halloween! That would just be a CRIME. Plus, I couldn’t resist. 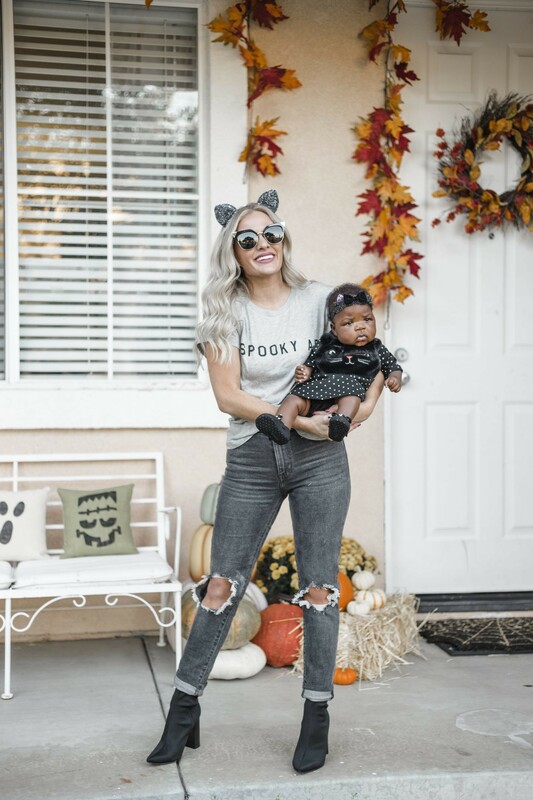 The past Halloweens as a mother I have had boys. Which meant the costumes weren’t/aren’t as cute. 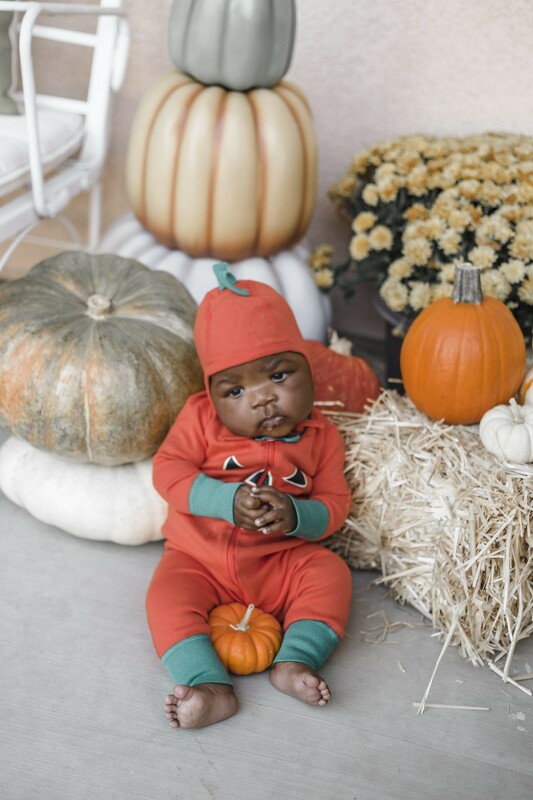 And before I get any hate on not including Brix or Finn in this post, I did ask and try my best to convince them to join in the Halloween photoshoot fun, but they were not having it. For some reason holding still and taking pictures did not sound fun to them. IDK. 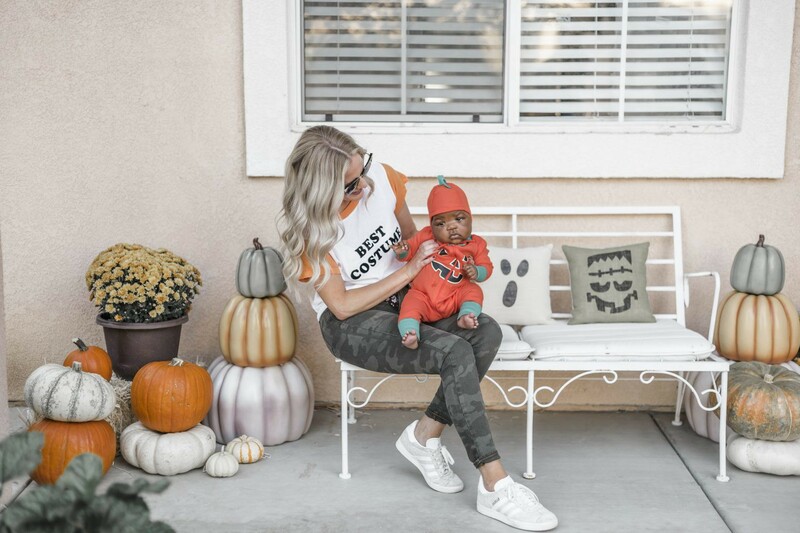 Are these Hanna Andersson Glow In the Dark Pumpkin Jammies the cutest thing you have ever seen or what?! 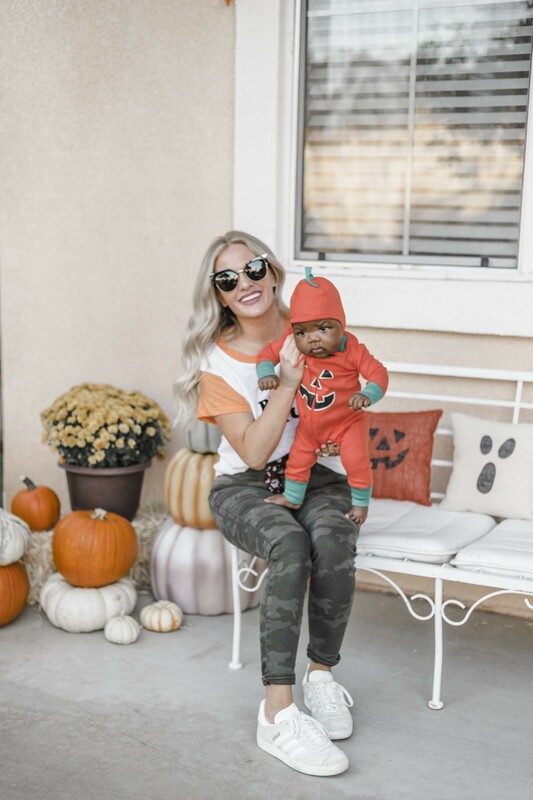 I am a huge fan of the Hanna Andersson Jammies in general and just about died when I saw these Pumpkin ones! They also come in a ghost version which is adorable too! Both are on sale for half off right now. I snagged this Pumpkin Who Can You Be Cap from there as well! (Also half off!) It comes in so many cute option! There is a bat one, cat, unicorn, ghost, etc! AHHH brb going to buy them all. 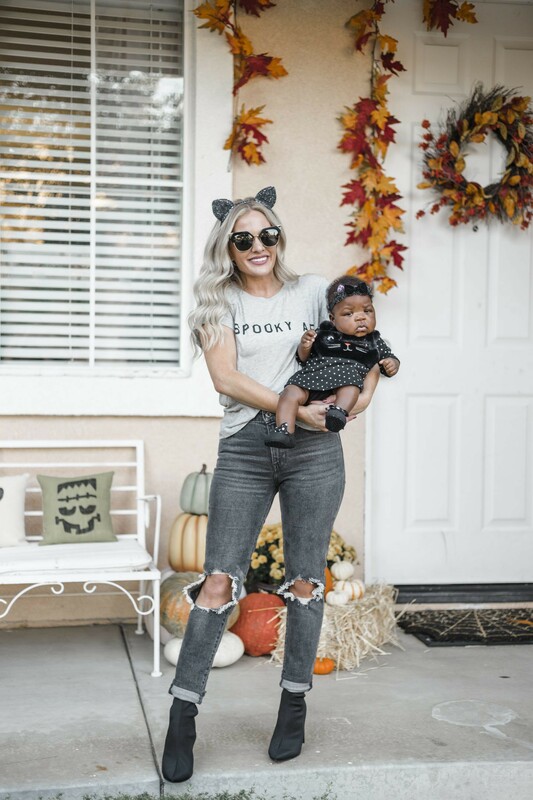 My Best Costume T-Shirt is by Wildfox and I literally have people stop me and comment on how amazingly simple yet funny it is every single time I wear it! I love Wildfox because their stuff is so freaking soft and comfy, and this tee is no exception! Finally got myself Camo Pants and these ones from Sanctuary have the perfect amount of stretch to them, and are a great price! My trusty sneakers are a washed out white/cream pair by adidas and I LOVE them! Can we all take a moment to scroll back up, and look at the photos one more time to appreciate how amazing Nina’s cute baby legs are?!?! I swear I just want to eat her up. Also, her face in these pics…not sure if she’s into being a cat or not. I found her Cat Long-Sleeve Dress at Baby Gap. I love that it is an actual dress and made with soft material. Plus since it is a dress, and not truly a “costume” she can wear it year round right? This dress has have a cute baby beanie that goes with it, but for pictures I chose to opt for some cat ears instead, so that we could match. Guys, I love my Spooky AF (as Frankenstein) tee! It is so silly and sassy, and I do like a good sassy tee. Just like Nina’s Cat Dress, I think this tee can be worn year round, because let’s be honest. I do often wake up and just look pretty spooky on some days! My jeans are these Free People ones in black, but they come in lots of washes and colors. 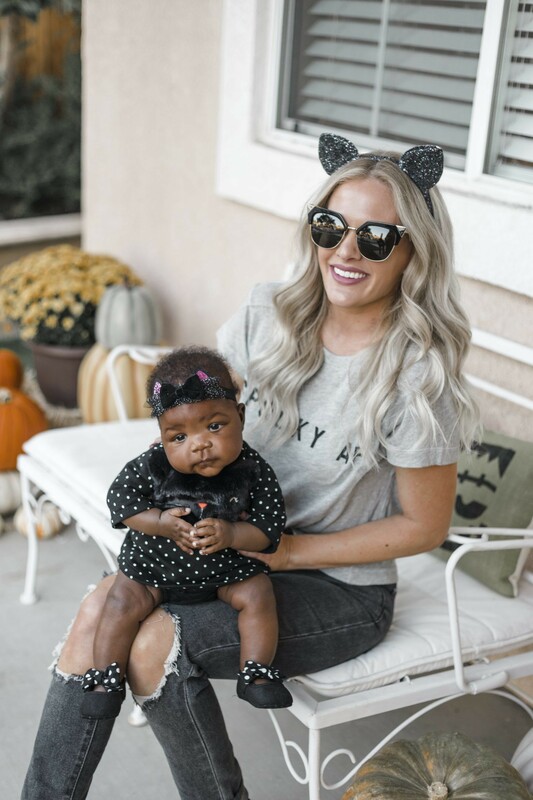 Yes, these Jeffery Campbell booties are making an appearance again — so buy them already, they are that good! 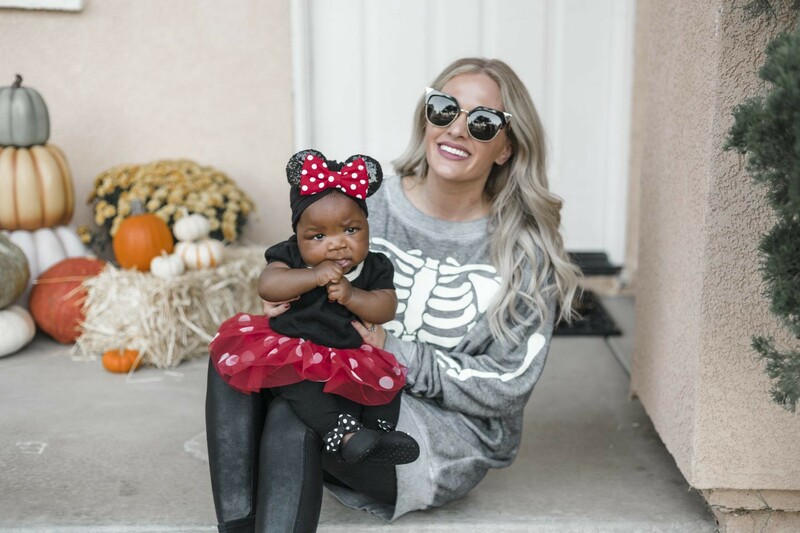 Nina wore this Minnie look to Mickey’s Halloween Party at Disneyland a few weeks ago! When I showed it on stories I only got like 450 DM’s asking me about her outfit. So I think maybe you guys liked it. The main part of her Minnie costume is this Baby Gap Minnie Mouse Dress (on sale right now so grab it!). It is so so cute!! Even cuter in person if you can imagine that! I love that it is made with soft materials so it is baby friendly. It does not come with any bloomers, so I have her wear some simple black leggings under it. 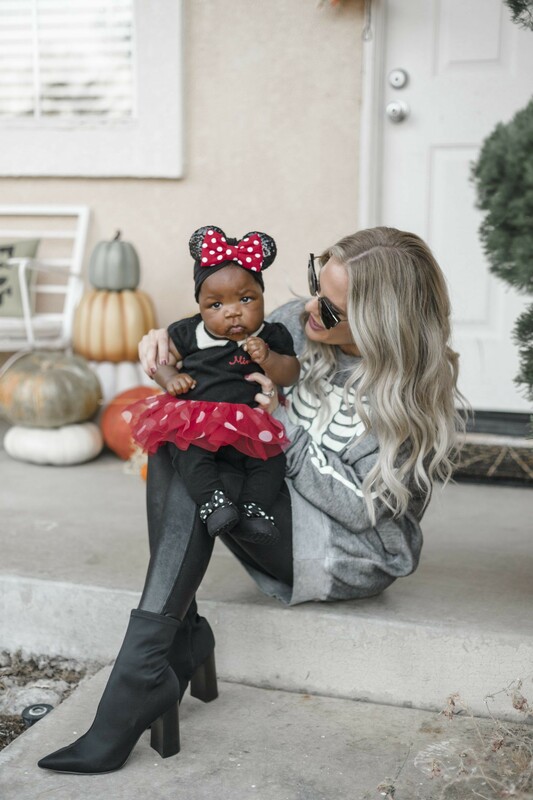 Her Minnie Ears are actually a baby turban from Etsy! Hers are the black turban with black sparkle ears, and red + white bow. However, they come in so many options! I just ordered the pink for her, because she needs it. My oversized insanely soft sweatshirt dress is….Wildfox! 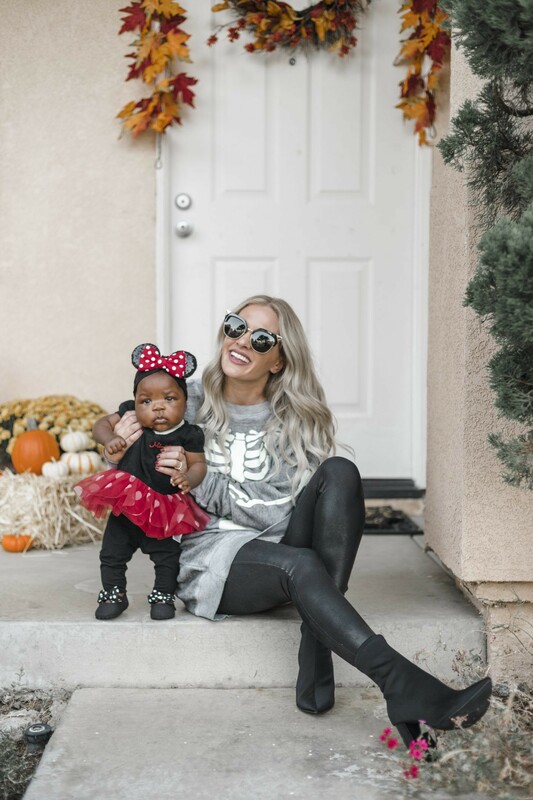 I love paring this X-Ray Vision Road Trip Sweatshirt with my Spanx Faux Leather Leggings. If you do not have a pair of Spanx Leggings yet…stop reading this and buy yourself some! Literally life changing! Like eat all the oreo’s you want type of life changing! 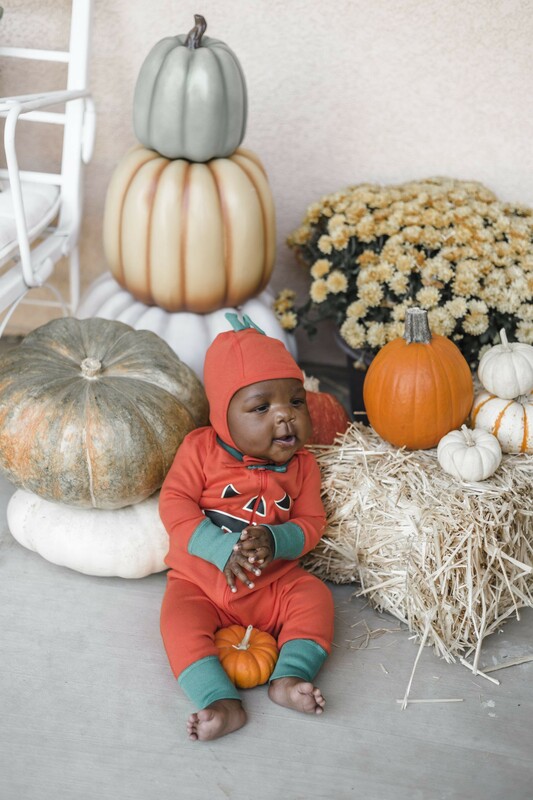 Which Halloween baby Halloween costumes are your favorite? Let me know in a comment below! 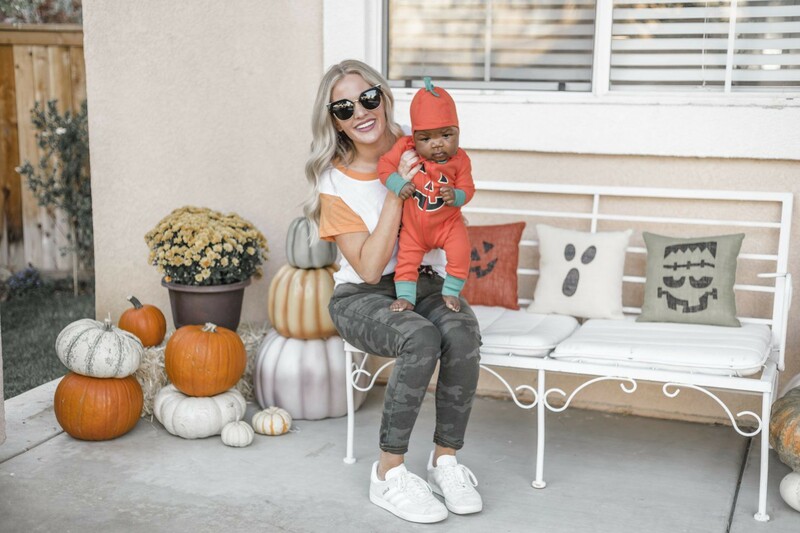 Looking for details on my Fall Porch Decor? Go here! 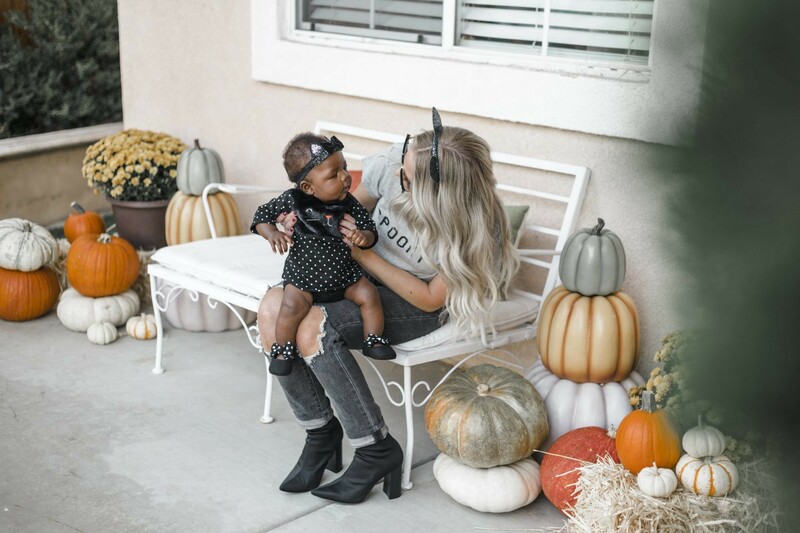 Originally published at Dress Me Blonde.